Greater Philadelphia Bicycle News: Bike Philly Raffle Winner!! His name is Ray Graudis from Milltown, NJ. 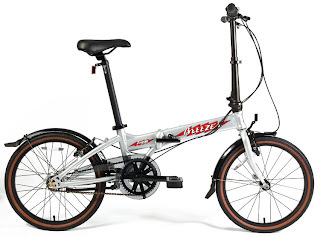 Ray has won a Breezer Ziggy folding bike, courtesy of Advanced Sports, Inc. I just spoke with him on the phone and he was very happy to learn of this news. Folding bikes are becoming more and more popular these days as an affordable and convenient option for riding short to intermediate distances, especially when commuting. Check out the Breezer Ziggy link above to learn more about this bike. Thanks to everyone who registered for Bike Philly, we look forward to seeing you there, rain or shine - it'll be divine! !